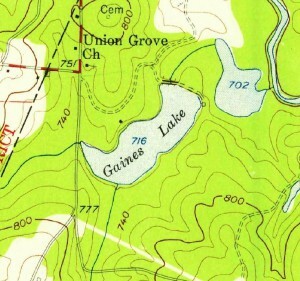 Lake Capri was originally known as Gaines Lake and was used for fishing. 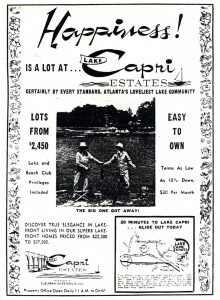 In 1963, Suburban Investments began to develop the area as Lake Capri Estates. Interstate 20 had just been completed out to Conyers. Rockdale County, with a population of approximately 17,000, was changing from rural to suburban. At that time, Rockbridge Road ended at Lake Capri and the only way to get to Conyers from the neighborhood was to take Lake Capri Road to Covington Highway. In 1963 and ’64 there were no water lines from Conyers to Lake Capri and water came from DeKalb County instead. Residents’ addresses were originally Lithonia, Georgia. Two of the first houses built here belonged to twin sisters and their husbands, Dot and Roy Thompson and Evelyn and Lewis Perkerson. The clubhouse was built in 1964 to be used as a sales office and stands on the site of the old Gaines Lake “bait shop”. Restrictive Covenants were established by the developer and one key restriction was the minimum square footage requirement for any home built. The goal was not to let it become a “fishing” community mixed with residential, which is how Norris Lake and probably others like Hi Roc Shores were developed. Lake Capri quickly attracted a somewhat affluent mix of Delta Pilots and engineers, Coca Cola executives, builders, real estate brokers, doctors and lawyers. The neighborhood has also been home to some notable folks: singer WEE WEE, who sang at the Olympic Games, Reverend Jim Bakker (who lived here with his brother following his stint in prison) and the brother of Senator William Proxmire. 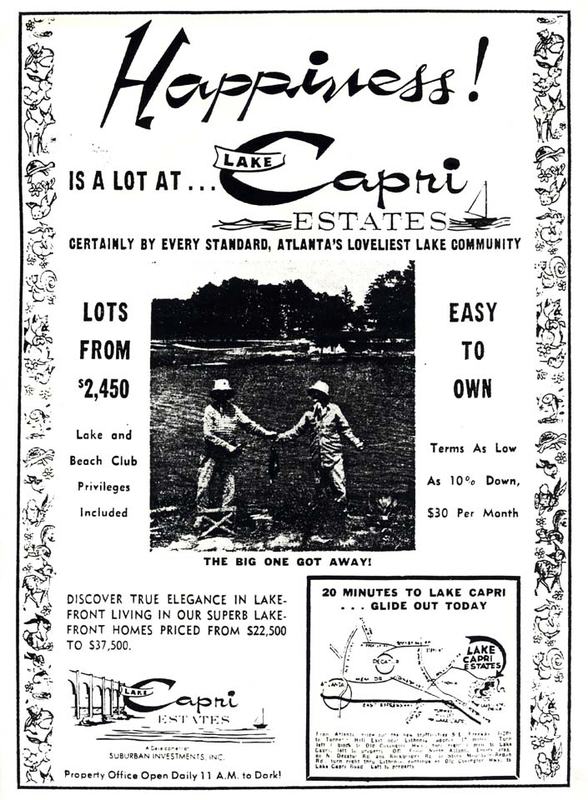 Lake Capri Estates has remained remarkably stable through the decades with many of the homes still owned by the original residents. In recent years, younger families and creative individuals have moved in, attracted by the natural beauty, unique mid-century houses and strong sense of community.